Ask any writer and they’ll tell you. Somewhere in their home, tucked away in a desk drawer, there’s probably a heap of scribbled notes relating to a ton of half-baked story ideas that may never see the light of day. 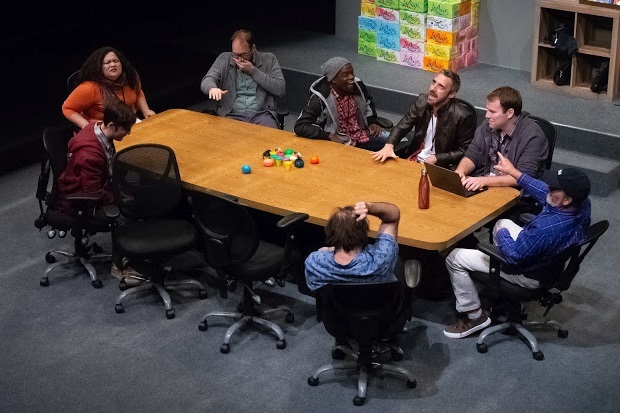 At the conclusion of Annie Baker’s most recent work, The Antipodes, you get the feeling that in order to fill the content of her play about brainstormers telling stories, she must have raided that drawer and incorporated as much of her unfinished work into her script as she could. The Beatles did it with most of side two of Abbey Road. Most of those songs were half-written themes that had been on the back burner for some time, but when revisited, refreshed, and strung together, somehow Mean Mr. Mustard and the gang worked. Whether Baker has succeeded in the same way with her play will undoubtedly be down to individual tastes. 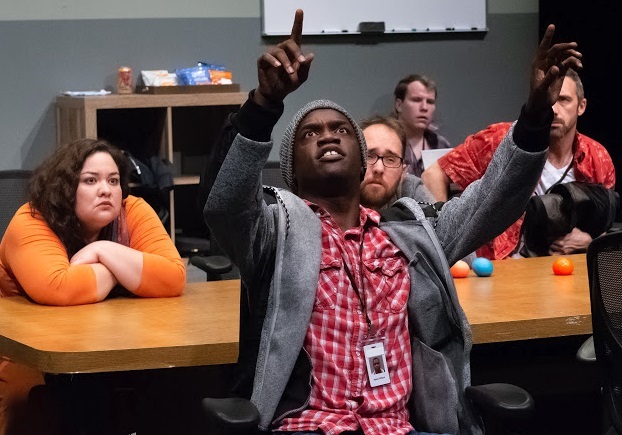 A script about coming up with the perfect plot in a play that itself doesn’t have one will prove to be an audience divider. And I’m sure that’s exactly what Annie Baker is going for. 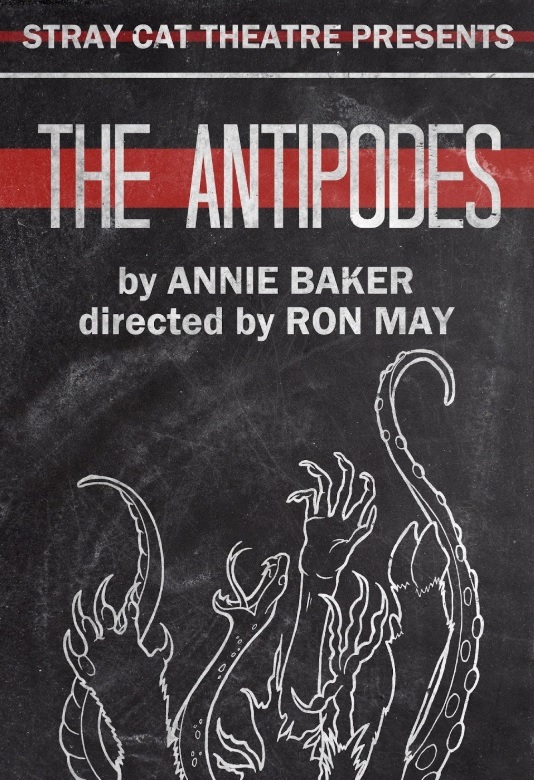 Directed by Ron May and performing from now until September 22, The Antipodes runs at approximately 110 minutes without intermission, which is at it should be. Intentionally structured without hooks to keep you wanting more, the play either works without an interruption or it doesn’t work at all. Somewhere in a corporate meeting room of an unspecified company, seven employees and one boss are gathered together. They’re there to brainstorm. They need to come up with the perfect story. And like everything else unspecified in the play, other than their names, we never really know who these people are or what the story they need to formulate is to be used for. It could be for anything. A film, a play, a product, a commercial, a video game, anything. We never know, but it doesn’t matter. That’s not the point. The point is, there are seven people in a meeting room and there’s a lot to talk about. The rules are simple. Anything goes. Those seven can say what they want. No boundaries. No self-censorship. It’s all about laying everything on the table and eventually coming up with the big idea. From time to time, Sandy even gives them subjects. “The worst thing that ever happened to you,” he’ll say on one day, then, “Biggest regret,” on another. Then the team proceeds to talk. And talk. If anyone comes up with the best personal tale, ironically it’s not a member of the team. Sarah (Shannon Phelps) is the unconventional office assistant who from time to time enters the meeting room and takes the orders for lunch, or passes important though private messages to Sandy, her boss. When Sandy tells the young woman to remain in the room and tell a tale, Phelps steals the moment with a rambling story of her childhood, involving a talking doll, human skulls on sticks that light fire from their eye sockets, and family members turning to ash. 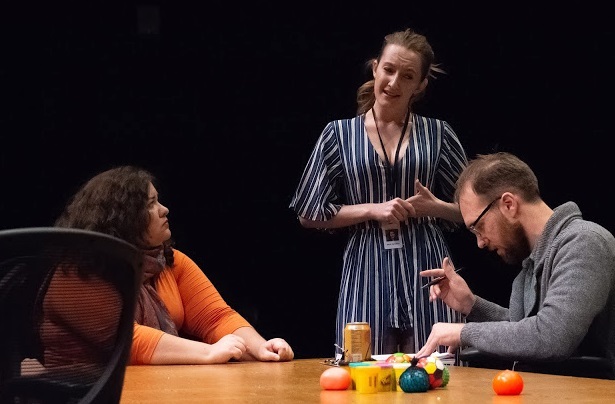 She delivers the whole increasingly bizarre monologue in the style of an airhead having a casual conversation with a friend at the mall, and it’s a hoot, but ultimately, like a lot of what’s in the play, to what end? Film critic Roger Ebert often talked of discussing film with college students who would look for meaning in a movie that the writer never intended, yet somehow finding one. 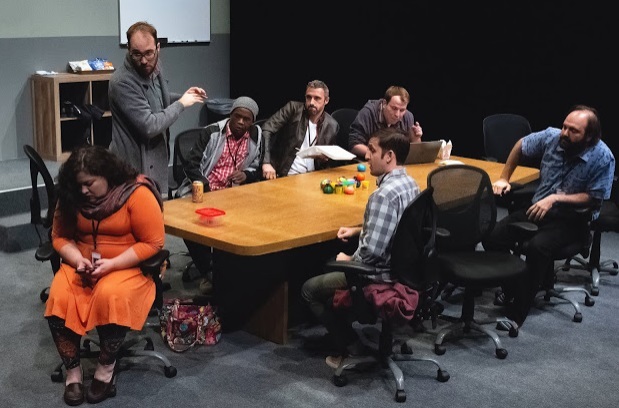 Like those film students, audience members will find individual meanings in Baker’s play about the telling of stories that were never intended, yet find one that suits their own agenda. The intentional ambiguous nature of what occurs and what is spoken may frustrate, particularly during those moments where the team is exhausted and remain silent. You could find yourself thinking, So? What next? And while the play is not told in real time – this meeting stretches out for several months – it can often feel like it. In fact, it’s the passing of time that becomes one of the most creative elements of the play. What looks initially like a form of musical chairs as the team move around the table and assume a different position you soon discover is meant to represent a different day, though, as with most of what you’ll see and here, it’s not immediately obvious. It’s only when Sarah enters wearing a different costume than the one we saw her wearing just moments ago that it suddenly hits you; time has passed. And things become even more creative when, to indicate the passing of several days within seconds, Sarah disrobes garment by garment in the middle of a sentence. It is said that for any idea to work, in addition to taking off, it needs to land. 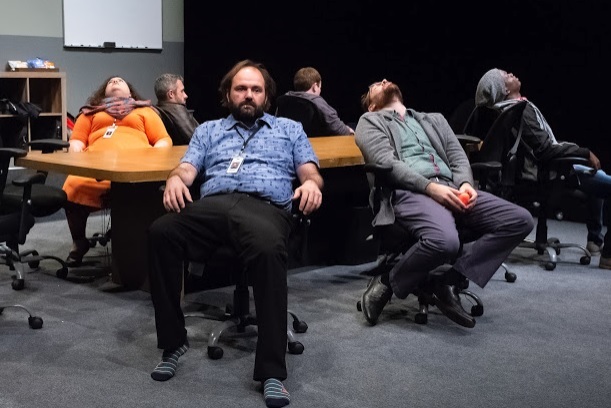 Annie Baker’s The Antipodes is full of ideas flying all over the place, but most have no landing gear in sight. And maybe that’s what Baker was intending, it’s hard to say. No matter what idea the team delivers, nothing ever lands. Perhaps every story has already been told. After all, isn’t that what Shakespeare scholars have been saying for years?